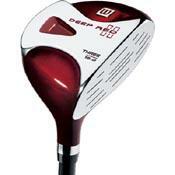 The New Deep Red II Fairway Woods have 40% more weight low and deep for maximum distance and forgiveness. The new low profile face promotes a higher launch angle to get the ball up and out. Bought this on eBay as I have the driver already. I went for steel shaft as I'm a bit erratic and felt I needs the extra feel to control the club head. Not been out on the course yet but 2 100 ball sessions in the range and it's sailing away beautifully. Lovely feel to the club and it's doing wonders for the confidence. I'm consistently hitting over 200 off the mat which is great for me. In the hands of a better player I'm sure it would go further. Love these fairway woods. Tried Adams and Taylor Made before these with varying success. Bought the 5 wood on ebay for $50! It's got a regular steel shaft but is so easy to hit and finds the fairway all of the time. So straight, and no need to smash it,for a 5 wood,it goes for miles. Decided after sucess with 5 wood to buy the 3 wood, got the prolite stiff shafted 13 degree on ebay again for $140 this time. Exactly the same results plus it goes even better, will out-drive my playing partners using drivers most times. Can get easily 220-230 yards, with minimum of effort. Have to say that these clubs will straighten any hook or slice you may have.They are great value for money, and look great as well with the deep red heads. Haven't had any problems, so can't say!! Love the 3 wood, I had been playing with a driver and a 5 wood for a long time decided to at a 3 wood and found the Wilson for 40 bucks at rockbottomgolf.com I love it with the steel shaft easy to hit and shape shots!! This is a solid, attractive and forgiving 3-wood.I'll admit I was drawn to this wood because of its looks -- the dark red head is flat-out cool. However, I'm impressed by its feel, forgiveness and accuracy. I got the steel-shafted version -- true temper dynamic gold R300 -- because control is my No.1 priority in a fairway wood. I've been more than impressed by the feel and sound of the club and the steel shaft gives it a great trajectory.